Plate measures 7 1/4 inches in diameter. Seven different animals and two cavern scenes are printed in reddish-brown on white background. Edges have a gold scalloped and daisy design. The gold is worn off is some places. 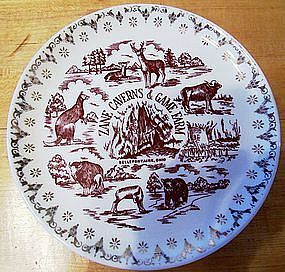 Back of plate is plain. Use USPS link to calculate priority mail from zip code 43570 to your zip code. Weight is 1 lb. If other form of shipping is desired, please email preference.